First of all, this comic is adorable, especially with the character of the lizard. Izumi draws him as a very simple cartoonish figure that looks more like a worm than a lizard. This ends up contrasting the traditional shojo look of all the other characters in a fun and humorous way. Add on his kind and sweet personality and you can’t help but to also be charmed by the lizard prince. Izumi also gets me once again with those surprise endings. The first chapter ends with such a twist that it changes the tone of the rest of the comic. The problem is that CMX spoils this reveal in their plot descriptions on the back of the book and on Amazon. So I recommend that if you can, avoid reading any other plot summaries outside of this review and just start reading this book. I am sure you will enjoy the book much better that way. That is really the only gripe I can find with this comic. This was an absolutely delightful read. Even at the parts were I was afraid that it was about to go into cliched shojo tropes, Izumi manages to keep the tone fresh and entertaining. If you enjoy your shojo charming and light hearted, you really should check this one out. The Good: Very cute story with nice development and one great plot twist. The Bad: CMX spoils that big reveal in book descriptions. Final Verdict: The Lizard Prince is a magically charming shojo fairy tale. Read it. 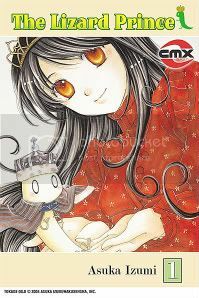 Review copy provided by CMX Manga. This entry was posted on Monday, November 16th, 2009 at 2:16 pm by Scott	.